...that Annie Lennox is right. It's not a war, it's a massacre. Of course, so is Iraq, and Afghanistan. But in this case, could it be that they're intentionally building outrage, in order to prepare a framework for a larger "incident"? Kevin Ryan on Mon, 01/12/2009 - 9:03am. The sooner the Truth comes out, the sooner will we have peace and prosperity for all in the world. We all know that the world is now governed by a criminal syndicate. The sooner we can prove 911 Truth in a court of law (in any Western country, even tiny Luxembourg), the sooner will we have peace on this beautiful world. Secret services around the world must KNOW what we here in the international 911 Truth movement know: 911 is an inside job. They must be complicit. Just as they are complicit in raking up private finances through the sale of drugs. Then there is forensic evidence that no judge nor parliament, anywhere, dares look, for fear of life and fortune. You are right! We know the tactics. As everyone else here at 911 blogger knows, Gaza is the last gasp of a dying Roman empire. Nuke Iran, kill the Palestinian resistance, make war with the Chinese in Africa, bomb Lebanon, invade Iraq, assassinate by trained squads in Latin America, kill Afghanis! "We are the Tyrants of the World! ", they say in their last breath of life. Now "they" are trying to blame Iran and Syria, the last vestiges of resistant regimes. But the PEOPLE of Egypt know the Truth, by underground tunnels. No loss of pay-check, exodus folks. The financial world is in any case Kaput by the same Zionist Kabal operating state sponsored financial Ponzi schemes. Some people say that Amerika will soon be forced to abandon seven hundred international USA bases together with thousands of USA troupes because the USA soon cannot pay for the repatriation of deployed USA armies. Let abandoned American soldiers beg in the allies of Baghdad. Makes me wonder what happened to the missing 3 trillion of USA Pentagon dollars that Brave Cynthia (save Gaza from death) McKinny was asking Pentagon Chief (shock and awe) Rumsfeld. Part of these funds, certainly have been used to get certain people elected all over the world, to spread democracy. Worldwide EXODIS and STRIKE in the name of Truth and Justice! No more collaboration in crimes against humanity! Unless, of course, honourable Barak Hussien Obama means Real Change, instead of us going the EXODIS rout accross the Red Sea of blood. Under Obama, USA armed forces will still be in the charge of the CIA . lesage on Mon, 01/12/2009 - 12:14pm. get her on 911 Truth. If she is not already aware. constitutional911 on Mon, 01/12/2009 - 2:52pm. - To kill brutally or inhumanly. Israel knows damn well that Hamas hides among the civilian population, like in schools and mosques. For Israel to bomb these targets anyway shows recklessness and extreme indifference to human life. As of this post, almost 900 Palestinians have been killed and 3500 injured from Israel's attack on Gaza. 19 Israelis killed over a 6 year period versus 900+ Palestinians over 2 weeks. Very highly disproportionate. BoneZ on Tue, 01/13/2009 - 7:38am. I wonder why if some countries have suffered economic sanctions even though their leaders were falsely accused, Israel has not. Spaniard on Tue, 01/13/2009 - 6:09am. US Government denies story that Bush left podium to take Olmert call. Olmert said he told Bush that the United States should not vote in favour, and the U.S. president then called Rice and told her not to do so. Also : Israel admits: "No Hamas rockets were fired during ceasefire"
The Israeli Spokesman (Australian born!) Merk Regev, accepts that Hamas did NOT violate the Ceasefire UNTIL AFTER Israel attacked the Gaza Strip on the 4th November! This proves that it was ISRAEL that broke the ceasefire! constitutional911 on Tue, 01/13/2009 - 12:18pm. Hilarious, pitiful, and tragic... What Truth is up against. lesage on Wed, 01/14/2009 - 4:08pm. 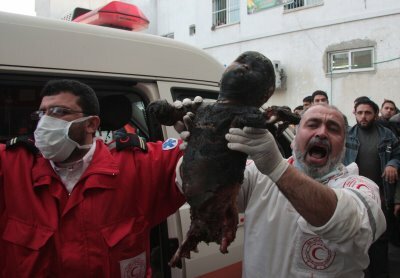 On Friday,PCHR,the Palestinian Center for Human Rights in Gaza accused in a statement, the Israelis of using phosphorous bombs over Gaza Strip.Raji Sourani, the chairman of PCHR, said that "This is not the first time we [PCHR] have documented the Israelis use of prohibited chemical weapons against the Gaza civilian population.The HRW Human Rights Watch senior analyst Marc Garlasco said in an interview on France Chanel 4 TV that .."Israeli artillery bursted fire of white phosphorous shells over Gaza City. "Garlasco said .."I have been standing at the border for the last few days ,watching Israeli artillery firing white phosphorus shells into refugee camps". 911 seemed to be a TEST of Psychological Terror Based Warfare Conditioning. To herd the sheep into a fascist dictatorship. The same weapons used in Palestine / Gaza WILL be used by the Military Industrial Complex on American Soil. It looks like the Military-Political Zioni$t$ may be the real problem. On both sides of the aisle. I am sure $ucce$ful weapon$ te$t$ will bring in more orders. What's a war crime to us is just a brochure for them. One day, soon, American Children may be going through what the Palestinians are going through. The victims on 911 and the victims of the war crimes ongoing in Gaza now share the same criminal network of globalist mass murderers. We cannot deal with one and ignore the other. No not just the Israeli military industrial complex but also a number of covert silent partners in the Arab nations, Europe, the US AND Asia. Look at the contrast in Dubai and the refugee camps in Palestine. So its not just Tel-Aviv which is the problem. The SILENT INACTION by the govts of the world on BOTH 911 TRUTH and the War Crimes in GAZA etc is telling. Its up to the independent media and activists. constitutional911 on Wed, 01/14/2009 - 11:54am. An unusually powerful piece of music, by the grace of Michael Heart. gyrolad on Tue, 01/13/2009 - 1:35pm. Joe on Tue, 01/13/2009 - 6:03pm.